The last time that Jabari Parker was not considered elite was a very long time ago. So long ago that more than likely the only reason he wasn’t considered elite at one point is because it’s just weird to nationally rank 10-year-olds. 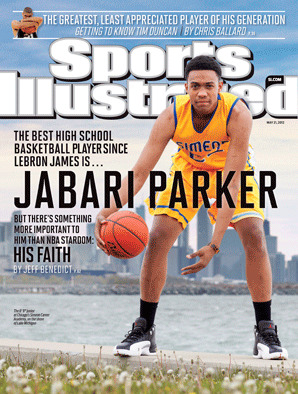 Ever since then, since Parker was scrimmaging with national high school basketball powerhouse Chicago Simeon as a 6’2” 6th grader, the term elite and Jabari Parker have had a seemingly inseparable marriage. From his four high school state championships, to being the best high school basketball player since Lebron James, to being selected #2 overall out of Duke in the 2014 NBA Draft, Parker has quickly validated his accompanying hype every step of the way. No, Parker’s game hasn’t fallen off by any means – he is only 21 years old and, despite an ACL tear suffered less than two months into his rookie year, he remains one of the more exciting and talented young players in the NBA – but for the first time in his career, the validation of the hype that Parker entered the league with has yet to be fully attained. Parker has had a solid start to the season, but the crutch of youth and promise that Parker and Milwaukee Bucks fans have leaned on so far during his brief NBA career is becoming wobbly. As it does for any young player, this crutch is beginning to give way to the expectation of consistent production and wins. Where will Parker and the Bucks be when this crutch gives out completely? Only time will tell. For now, let’s look at what time has already told us. Not bad for someone who aspires to be a middle school teacher someday, huh? One of the more unique and impressive aspects of Jabari’s game (which is evident in the first few highlights in the video) is not that he can out muscle or shoot over smaller match-ups and blow by bigger match-ups (which he can). It’s that Parker has shown the ability to out muscle or shoot over bigger match-ups, and blow by smaller match-ups. That is not normal. Like, at all. However, it’s just one of the exploits Jabari used to average a smidgen under 19 points on 50% shooting after the All-Star break last season – marks that helped fuel the hype train that steamed into the 2016-17 Milwaukee Bucks season. On the surface, Parker hasn’t done anything to slow this train down. He’s averaging a healthy 19.1 points on 47% shooting after a slow start, which includes a conscious effort to join this decade as seen by an uptick in both 3-point field goal attempts and percentage. This sort of scoring stat line can conceivably be Sharpie’d in as Jabari’s statistical floor for probably the next decade of his career, with a scoring title not completely out of the realm of possibility. His ceiling is that high as a scorer in this league. So what is so curious about the state of Parker’s game then, you might ask. Well, It’s the other side of this Jabari Parker case study – the mental side. Although a considerable amount less understood than the physical side of the game, the mental side is the make-or-break side for physical talents such as Parker. No matter how big, how athletic, and how skilled a player is (other than maybe Shaq), a sound grasp of the mental aspects of the game is a prerequisite for individual players and teams to realize their full potential. This is where the Curious Case of Jabari Parker gets curious. Here, John Leuer is guarding Parker and goes under a ball screen set just 16 feet away from the basket. Despite a wide open shot opportunity, Jabari forces a drive into the chest of a well positioned Leuer only to score the basket anyway due to his supreme athleticism and skill. This play exemplifies the notion of Parker’s physical skill set outpacing the mental. It also serves as an example for a potential reason why, in the early stages of this season, his free throw rate remains at a similar place as last year on a per Drive basis. Going forward, look for this rate to increase over time if Parker shows more of a willingness to take these open jump shots. Shots like this for a player capable of hitting threes makes Kidd installing a shocking device on Parker’s jersey perfectly acceptable for when he needs to be reminded to take just a few steps back. Something tells me those catch-and-shoot long twos wouldn’t last much longer. Despite the worth associated with a 3-point shot and the subsequent spacing it provides the rest of his teammates in the half court, it’s imperative that Parker remains aggressive in his mindset to attack the basket. In this video, Parker clearly has enough room for a clean look at a catch-and-shoot 3-pointer, but also sees a crease that leads to an even higher percentage shot at the rim (it also doesn’t hurt when you’re able to brush off a 6’9” 240lb forward and finish through one of the best centers in the league). It’s situations like this where it’s clear that Parker is reading the situation and reacting appropriately. He just has to do it more consistently. Finally, Jabari Parker’s arch nemesis: the pick-and-roll. Graduated we are now from the entry-level mental digestion required in isolation and spot up situations, and we advance into how Jabari fares as a ball handler in ball screen situations. To summarize, Jabari is not a pick-and-roll player; he never has been. Think Carmelo Anthony as opposed to Lebron James. Due to the skill set he possesses at his size, however, it’s hard to argue with the idea that he could thrive in a ball screen situation. There’s only one problem: it’s unclear as to whether Parker has ever been taught how to read the pick-and-roll. In his defense, consistently making the right read and executing in ball screen situations is not something that is easy to do. It’s why Chris Paul is Chris Paul and Elfrid Payton is Elfrid Payton. It’s also something that the Bucks may not even need him to become good at in order to eventually develop into a contender. What is a certainty, however, is that developing a feel for ball screens definitely wouldn’t hurt, especially considering the high prevalence at which the action is used in the offense of the Bucks’ and just about every other NBA team not playing in Madison Square Garden (consider the quota of one dig at the Knicks per post reached). And then there was the bad, titled: Dude, Don’t Pass It There. Getting to a Lebron level in pick-and-roll efficiency is probably both unattainable and unnecessary as it relates to the success of the Bucks. However, as it relates to Parker, it’s hard to even recall a memory of him decisively hitting an open man more than one pass away in a situation other than when he needs a penetration attempt bailed out. Despite this, Parker is not incapable of making these reads. A fair starting point is probably to look at his number of ball screen repetitions, repetitions of which he certainly hasn’t had enough of to become an effective pick-and-roll player at this point in his career. In his one season at Duke, Parker only used 17 ball screens the entire season, and uses ball screens more in ad-lib type motion situations than actual sets at the NBA level. This leaves the Bucks in somewhat of a dilemma: Do we give Parker consistent reps in ball screen situations and trade some short-term offensive efficiency for potential long-term versatility? Or are we okay with only featuring him in other areas of offense and losing efficiency when unscripted pick-and-rolls undoubtedly present themselves? They are valid questions due to the fact that Parker already is, or projects to be, exceptional in other facets of offense (he finished last season as one of the better post-up forwards in the entire league on a points-per-possession basis), and the Bucks already have a superstar facilitator in the making in Giannis Antetokounmpo. The Bucks’ answer to this question as played out on the court appears to be featuring Parker elsewhere, but not entirely. After literally starting the season with two set play Parker pick-and-rolls (both of which ended in turnovers), Jabari has been featured less in set ball screen situations compared with last year’s post All-Star break clip. Knowing that repetitions alone do not automatically result in improved performance, the Bucks aren’t force-feeding Parker these opportunities. Instead they’re going with the flow, per se, hoping the development comes, while featuring him in areas more closely aligned with his strengths. It’s hard to fault this logic, but it does leave the question on the table of whether or not this will hinder the Bucks long-term. Regardless, it’s definitely something to pay attention to going forward. How, you might ask, have I not yet brought up Parker’s defensive deficiencies in a comprehensive evaluation of his game? Well, it’s because, unlike the title of this piece, the state of Parker’s defensive impact is anything but curious. It’s something that was included in early scouting reports, and is something that may actually have been understated in its pessimism. Rather than spend another thousand words going through the intricacies of Parker’s defensive struggles, I’ll just provide a synopsis: Although he is an average on-ball defender in isolation situations, Parker’s consistent and sometimes profound lack of positional awareness, coupled with periodic issues urgently reacting to situations, leaves him near the bottom of NBA players in terms of defensive impact. Common traits of players on this level defensively are athletic ineptitude, indifference, or both. By all accounts, neither apply to Parker, as he has good feet for a player his size and, generally speaking, really does care. This bodes well for him improving on this end. However, this, along with the other developing aspects of Parker’s offensive game are reasons why he hasn’t yet made a definitive impact on the Bucks consistently winning basketball games. Obviously there are many other factors as a team that help or hinder the pursuit of winning, but the fact that, up to this point, Parker has been a negative plus-minus player, and had a -3.19 Real Plus-Minus last season (negative in both offensive RPM and defensive RPM, and 80th overall out of 85 NBA power forwards), has to at least be somewhat indicative of how he is impacting the game, especially when compared to Giannis’ 1.11 RPM last season, which was good for 16th out of 66 small forwards. RPM has widely been accepted as a credible source of summarizing what is happening without being able to explain why it’s happening. Consider yourself filled in on the why. Now before you finish reading this article and go tell all your friends that the Bucks should trade Parker to a team like the Celtics for a few of their hoarded first round draft picks, it must be made clear that Jabari Parker is a potential superstar, someone who is most likely going to play in a lot of All-Star games and has the potential to win a scoring title someday. But if the Bucks are going to win an actual title someday (as opposed to just being a contender), they need Parker to hone in on some of the aforementioned mental aspects of the game and become someone that consistently leaves a winning imprint on basketball games. Will Jabari Parker and the Milwaukee Bucks take the requisite steps this season towards this ultimate goal? After this, I’m sure I am not the only one who is curious. Really well written. I think a lot of the points made here are valid arguments that should draw conversation from any NBA fan, not just Milwaukee. One thing I think is important to point out is how Jason Kidd coaches this team. Watching clips of Lebron during the P&R shows you to a T how it is supposed to be run, but if you pay attention to the other players on the court they are all ready for the pass, whereas the opposite is true for Milwaukee during the P&R clips. It also is fair to wonder if maybe Kidd doesn’t want Jabari taking jumpers sometimes, or is instructing him to get to the bucket. The way the Bucks Organization has approached there young superstars has been to work to perfect 1 or 2 things a year in the young stages. Then the next year try 1 or 2 more. Regardless, the team has a brighter future than it ever has before, and there young core will carry at the minimum 2 All stars. I must say your overall assessment while well documented is a tad premature for my liking, Jabari is still a 21 year old kid in his 1st full year from a major knee surgery, lets revisit this after he signs HIS 100 M deal.